Another hair transplant success story! Here at The Treatment Rooms London we love sharing our patient’s success stories- especially after they have gone through a hair transplant. A hair transplant doesn’t give you immediate results e.g. within days. As hairs have to be taken from one part of the scalp and re-implanted into another, the roots can take some time to grow. We tend to advise that the regrowth process takes at least 12- 18 months. So you can imagine our patients therefore have a huge amount of patience! This friendly patient is often in the public eye. He takes part in body building competitions so he wanted his hair to fit his style. He was suffering from an early stage in male pattern baldness; receding in the temples and his frontal hairline. In order to restore his hair to a hairline he wanted, the surgeons in our clinic agreed that he would benefit from a hair transplant. However, the key to a successful hair transplant was discussing how the patient wanted to style in his hair in the future. Our surgeons are able to implant hairs to match natural hair direction. This patient wanted to style his hair up, giving his hair fullness at the front. With this in mind, our surgeons had to carefully plan how many hairs would be required to give density and volume for this hair style. Extraction of 637 grafts for implantation into the frontal hairline and temple region. This was carried out using the FUE (follicular unit excision) method in one session. This patient’s result is 7 months post surgery. His hair follicles have clearly grown at a fast rate! 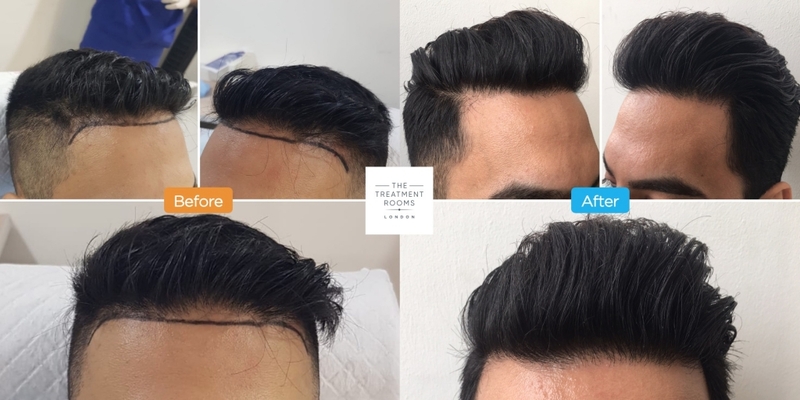 As you can see from the photo, instead of combing his hair to the side, our surgeons have implanted grafts so the patient can now style his hair up and back. This added volume and density has also rejuvenated his frontal hairline. You will notice that his hair appears more healthy and thick. Some of you readers may also question what this patient will do if he loses more hair? At The Treatment Rooms London we always think about the past, present and future of hair loss. The future of anybody’s hair loss is particularly important when it comes to choosing to have a hair transplant. If you don’t manage hair loss for the future you may end up with a hair transplant that looks odd in years to come. This is because you will continue to lose hair behind and around the transplant if you don’t take preventative measures against the ongoing hair loss process. For this patient, taking medication like finasteride was undesirable. So he is currently on a regimen of Minoxidil which he is using to preserve his hair growth and thickness. UK Hair Transplants– why is the UK one of the best places in the World to have your hair transplant? This blog helps to explain some of the reasons why. Medical tourism is a term used to describe people going abroad to have a medical or surgical treatment. It has always existed and in many ways is a good thing. In some countries some treatments may simply be unavailable. Medical tourism therefore opens doors for patients to go and seek treatment from a Surgeon or Doctor who is practicing in a different country. However, with the rise of social media and posting of before and after pictures, medical tourism has showed an ugly side. Some clinics are now able to aggressively advertise treatments attracting people from abroad for low cost treatments. In many cases these treatments are cheap because the clinic is cutting corners in the quality of care. This may include not even having a qualified Doctor or Surgeon carry out the treatment, (1,2). This really does put patients at risk. The worldwide press was shocked to hear about Leah Cambridge who died from going to Turkey to have her cosmetic surgery. The lure of cheap treatment can be enticing but should not trump quality of care. In the UK, hair transplant clinics are bound by the Advertising Standards Authority. The ASA puts a framework in place whereby clinics cannot advertise false claims or incentivise patients to undergo a medical treatment- including having a hair transplant. This means patients are given the time to reflect on whether a UK hair transplant clinic is suited to them. It also gives patients a chance to objectively assess a hair transplant clinic and surgeon on their expertise and experience in performing the surgery. There are no “add-ons” like those listed above to cloud a patient’s judgement. There are over 100 UK hair transplant clinics and some may not fulfil the two stipulations above. It is always important to double check the clinic. Feel free to go onto both the CQC and GMC websites to search for the clinic. The Treatment Rooms, London is listed HERE on the CQC’s website. The UK healthcare system has always put patients at the centre of care quality. The country has frameworks and legislation in place to ensure that safe and quality care is provided in any clinic. This means that as a patient you can expect your clinic and its surgeons to act professionally and provide objective advice to your concerns. If you live in the UK, choosing a UK hair transplant clinic is an easier decision. As you may know already, hair transplant surgery is a long day and being able to go back home to rest afterwards is important. Secondly, as a transplant involves surgery, there can be side effects and complications. You will want to see or touch base with your Surgeon at your convenience. Not only will this mean your mind is put at ease but also any treatment that is needed can be started immediately. This is obviously very difficult if you have had your transplant abroad. The Treatment Rooms London is South London’s First Hair Transplant Clinic. We take pride in seeing our patients one to one. We cut no corners when developing holistic, personalised hair treatment plans. These plans should always take into account your current and predicted hair loss. Without factoring in how you will continue to lose hair, a definitive treatment like a hair transplant can be futile. Hair transplant clinics abroad may advertise a one-stop-shop for all hair transplants. However, you need careful planning before undergoing the procedure. We have seen too many gentleman coming from abroad having had a bad hair transplant. Their experiences can be frightening with poor surgical technique, over-harvesting of hair and lack of hair loss planning for the future. What if you continue to lose hair behind your hair transplant? It will ultimately render your hair transplant useless and you may find yourself back to square one. If you needed more advice about your hair loss or about hair transplants in general our Doctors and Surgeons would love to see you. Book yourself a free consultation at The Treatment Rooms London by clicking HERE. The International Society of Hair Restoration Surgery has officially launched its awareness campaign around Black Market Hair Transplant Clinics. In this short blog we explain what is going on. As you may have read in our earlier blogs, (click here), we are seeing poor hair transplants being performed by unregulated clinics. Sadly, patients are seeking help from clinics to treat their hair loss and come away even worse than when they first visited. There is a growing number of black market hair transplant clinics that are performing dangerous and poor transplants. As a result the International Society of Hair Restoration Surgery (ISHRS), the global leading authority of hair loss treatment and restoration, has released a worldwide campaign. It’s called “Beware Of The Hair Transplant Black Market”. Why has the campaign been launched? The black market of hair transplant clinics consists of clinics that are primarily run by technicians. Sometimes there might be 1 doctor and 10-60 technicians who operate in a “conveyor belt like” manner. The doctor present in the clinic is mainly there for show only. Sometimes they don’t have a valid medical license or a job permit. Ultimately, corners are cut in patient care and patients have no recourse to make a complaint. The campaign has just started and is aiming to achieve a number of key objectives particularly around patient education. Patients are being misled by false advertising. Adverts on Facebook, Google and Instagram with pictures and videos about hair transplant surgery being so easy that patients can be operated on in an “assembly line” is misleading. Hair transplant surgery is essentially surgery. It requires a properly trained hair transplant surgeon (sometimes two surgeons) who are practising under a license and in a regulated clinic. Different patients have varying hair types and hair loss patterns so a “conveyor belt- like surgery” will not be applicable to all. It actually ignores the high attention to detail hair transplant surgeons must have in order to give patients safe, natural and long lasting results. The campaign is also collecting stories, photos and videos from Doctors and patients. If you have been affected by a poorly performed hair transplant then get in touch to share your experience (click here). Black Market Hair Transplant clinics threaten the integrity of hair transplant surgery including its Doctors and Surgeons who are dedicated to its practise. The beware of the Black Market of Hair Transplant Clinics campaign has just started. Expect some new developments on the topic by the ISHRS and BAHRS. We want to make it clear, The Treatment Rooms London fully supports this awareness campaign. We continue to see patients suffer at the hands of hair transplant technicians and unlicensed clinics. Hair transplant surgery is complex and the surgery is just the beginning of a long hair growth journey. Starting off on the wrong foot can be devastating. No patient should have skin necrosis as the result of poor surgery technique or suffer the effects of an over-harvested donor area. We encourage any patients looking to have a hair transplant in London or the wider UK landscape to do their homework on the clinic and surgeon they are visiting. If you wanted to know more about this topic then please click here to read our blog.